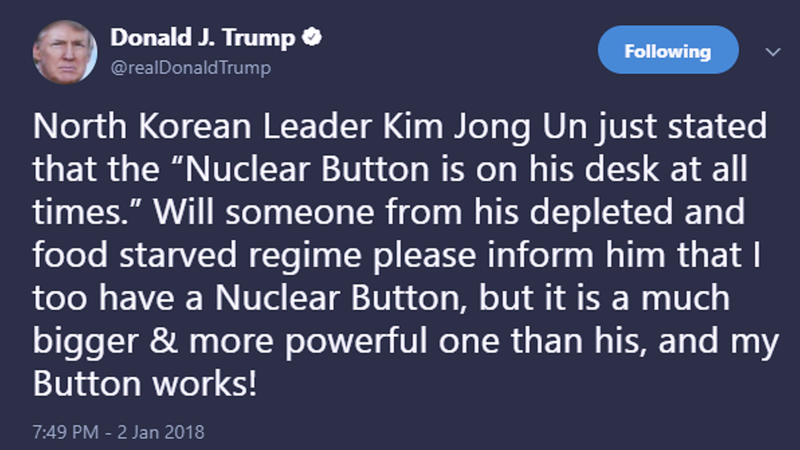 In response, President Donald Trump tweeted on Tuesday night that he is in possession of a “much bigger & more powerful one than his, and my Button works!”, thus proving the U.S. still has cringe-inducing capabilities the likes of which Kim will never achieve. The president was apparently not content to leave the world grappling with that imagery alone. Mere minutes later, Trump alerted the public that he would be announcing “THE MOST DISHONEST & CORRUPT MEDIA AWARDS OF THE YEAR on Monday at 5:00 o’clock.” He also exhorted everyone to tune into Fox News host Sean Hannity’s show at 9pm ET, just in case you somehow hadn’t had your fill of reality melting before your very eyes yet.